Blondie and Brownie: Two Weekends, Two Food Competitions, Are You Ready? Two Weekends, Two Food Competitions, Are You Ready? Chocolate and Chili, they go together like peas and carrots. Spicy and sweet, hot and creamy. Brownie's favorite chili is Cincinnati Chili which used some cocoa. The Bell House is about to see a lot of Chocolate and Chili, on two consecutive Sundays. 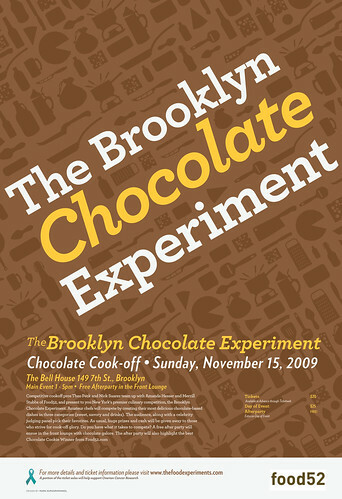 First up on November 15th is going to be the Brooklyn Chocolate Experiment. The first prize will include cash money and a membership to a Chocolate of the Month club. Yours if you impress the judges and there are some big names on that list. For more information, check out the website: thefoodexperiments.com. Tickets are still $20 and available here or at The Bell House box office. A good authority has let us know that Ben Van Leeuwen, one of the judges, will be doling out ice cream at the after party! The next week is the semi-annual Chili Takedown with a much-needed location change to avoid the congestion felt at Union Pool. Though the competitor list is now closed, you can get on that waiting list. 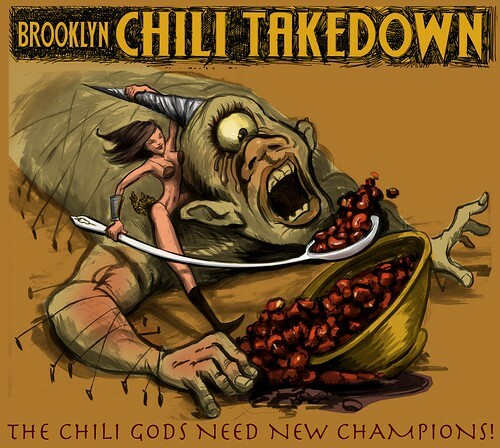 For info, check the site: chili-takedown.com. Tickets for this are just $15 and available here.